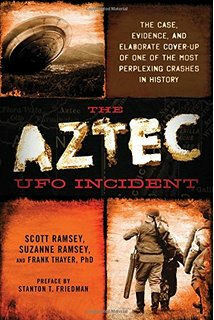 I, like many readers of UFO lore, had always assumed that the widespread condemnation of the 1948 Aztec UFO crash as a hoax probably meant that it was just that - a hoax. After all, what better way to muddy the Roswell waters than create additional UFO crash stories that later turn out to be fictitious? Some of the top researchers in the field have dismissed this case in the past, mostly on the basis of a court case which brought into question the honour and integrity of some of the key 'expert witnesses' of the case. A domino effect has killed this story across five decades. Through some excellent research, and lashings of plain common sense, the injustice with which this UFO case has been historically met has been put right in the 21st Century, mostly as a result of the work of Scott Ramsey. To be fair - and Ramsey is nothing if not very fair - other researchers before him have attempted to rehabilitate this case, recognising that there really is some fire behind the smoke. The authors of this latest book pay tribute to their efforts, as well as the intrepid author of the original case study: Dana's namesake, Frank Scully. Although there is a clear bias in favour of this incident being a credible UFO crash retrieval, the authors present the facts in a measured journalistic manner, with very little embellishment or sensationalism (although there is a tendency to paint the good guys white, and the bad guys black). The book flows well, and is written in clear conversational English. Interviews with witnesses, who come across as credible, are accompanied with plenty of background information and analysis. One quickly begins to wonder how this case was buried for so long. The debunking efforts levelled at the Aztec Incident early on were vindictive and ill-tempered, but also highly effective. No one wanted to touch this case for decades - it became toxic to Ufologists. After the Roswell debacle, the concerted effort to destroy those trying to expose the Aztec crash was finely-tuned and tightly controlled. For instance, it was interesting to read testimony related to how military service records are routinely fabricated to officially place a covert operative in a completely different location during a mission, so that if they whistle-blow their claims can be readily falsified by official documentation (p30). The trial of the entrepreneurial geophysicist Silas Newton and his scientific associate Leo Gebauer is covered in great depth in the book. The fraud case was instigated by a spurned newspaper correspondent, J.P. Cahn, who was determined to discredit the duo. Despite a lack of evidence to support Cahn's claims, and plenty to the contrary, the court moved against the accused whose reputations were duly destroyed. Yet, curiously, once that work had been done, no punishment was meted out against them. A further chapter rehabilitates the reputation of Silas Newton, drawing on documentation to reveal that he was no hoaxer, and that actually his standing as a model U.S. citizen was self-evident for anyone who cared to look. If I had a criticism of this book - besides the misspellings and typos - it would be repetition. There are detailed reviews of previous books about the Aztec case, as well as biographies of the researchers who contributed towards our understanding of what really happened (Scully 1950, Steinman and Stevens 1986, and Evans 2003). Sometimes, the same ground was covered too many times, seen from slightly different perspectives. That said, I loved the Frank Scully quote: "Why not go out on a limb? Isn't that where the fruit is?" A surviving transcript of a Men-in-Black-style conversation between AFOSI intelligence officers (hunting for remaining physical evidence) and local broadcaster George Koehler is published, and proves highly enlightening. No one knows what happened to the saucer and its occupants, besides a broad contention among anonymous whistle-blowing scientists that the craft was dismantled, moved to a testing facility and then subsequently ruined (chimps with hammers trying to figure out how a TV works springs to mind). Little wonder the engineers involved began a whispering campaign that quickly reached Scully's ears. 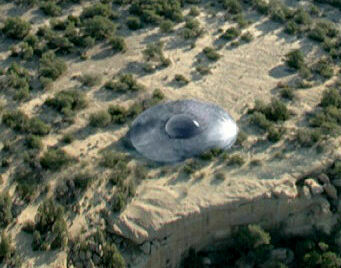 A lot of UFO activity was going on over New Mexico in those days, and there's plenty of speculation about how this saucer might have come down. A possible connection with the later Farmington Armada seems plausible - a wave of visitors paying tribute to their fallen comrades? There's no way of knowing for sure, of course. What's remarkable is how well Frank Scully's 1950 book ties in with the evidence which later emerged. I'm tempted to try to get his book "Behind the Flying Saucers" which, history and good research is now showing, was far from the sensationalist hoax it was made out to be. Subtitled "The Case, Evidence, and Elaborate Cover-up of one of the most Perplexing Crashes in History"